We’ve all been there: Schooling our horse, asking for something, but not getting the right answer. We try one thing and then another, the work is sticky so we try a bit harder. At the same time, the horse feels a bit more resistant. “This wasn’t just plain terrible, this was fancy terrible. This was terrible with raisins in it.” -Dorothy Parker. But then your trainer gives you a suggestion and it works in an instant. Or maybe you blindly try anything and accidentally get a great response. Your horse blows, rewarding you for getting out of his way. 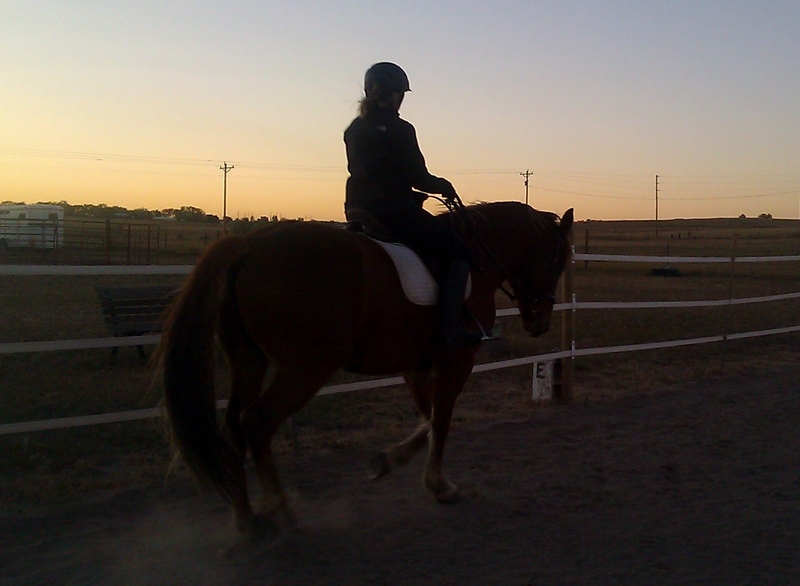 And what looked like a war of wills is just your problem, because the minute you make a change, your horse is perfect. Been there? What if frustration became your cue for humor? What if when you notice your _______ (fill in the blank with canter depart, contact, bend to the right, etc.) is terrible- with raisins in it, and you chuckle your way past the self-loathing part entirely? Riding well requires so much perception and awareness. We need all of our senses, including our sense of humor. I am pretty serious about humor and here’s why: Horses are big- they challenge us, they maybe even intimidate us. Those emotions make our bodies stiff, and when we’re stiff, our horses get tense. When we smile or laugh, our bodies get softer, more supple and again, that translates to our horses. Behaviorists tell us that horses can’t learn if they are afraid or tense, but most riders have learned about all they need to know from fear and frustration, too. Every now and then it’s good to be reminded that terrible, with raisins in it, might be a chuckle away from brilliance. Using humor as an intentional part of training doesn’t make you any less serious about any aspect of riding. It just means that you have some compassion for your horse, and even more important, for yourself. So, for everyone taking responsibility for their ride, and struggling to put a positive spin on it, keep up the good work. Humor does not trivialize the endeavor- it’s a very effective aid in the pursuit of your goal. Need some inspiration? This one never gets old. I’ve had a tattered copy on my wall or in my tack trunk forever. I keep it handy to remind myself of the real reward in striving for a dream: No regrets. Yes, dare greatly! -but with the help of a smile.